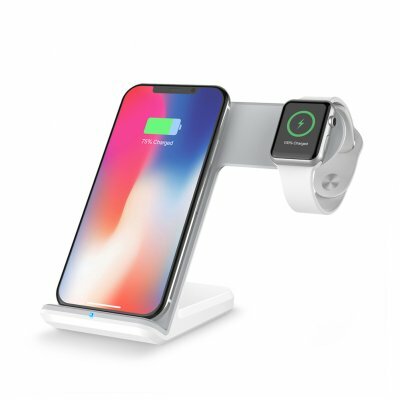 Successfully Added 2-in-1 Qi Wireless Fast Charger Phone Charging Station for Apple Watch iWatch iPhone 8 iPhone X and all Qi-Standard Devices to your Shopping Cart. The position of the watch can only be wirelessly charged for the Apple Watch, and it is not suitable for charging other brands of smart watches. With a Type C fast charge cable,if your cell phone without wireless charge function,your can use the data cable charge your smart phone with Type C port. Lightweight and portable, good for using at home, office, public area, etc. You have to charge them with a 9V/1.6A Adapter while charging phone and the watch at the same time. (Adapter is not included).